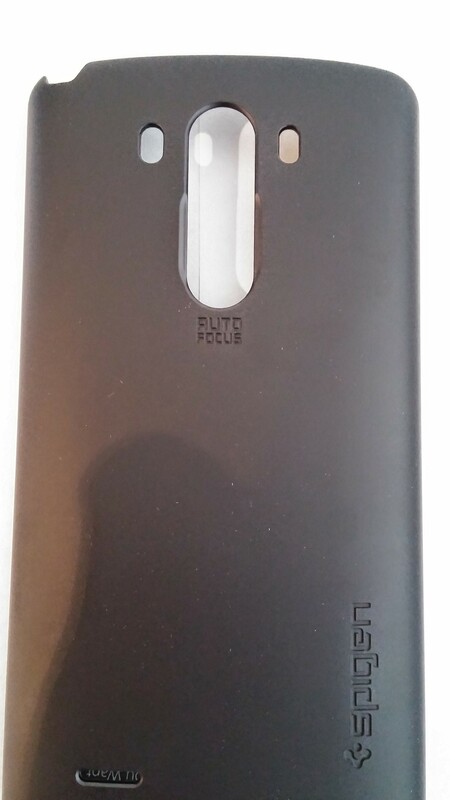 Has an almost pointless engraving on the back that says "Auto Focus"
If you are looking for a low priced case that offers protection without adding significant weight or bulk to your device then this case is a good buy. It is not what I am necessarily looking for, but I know there will be plenty of people out there who like this type of case. The G3 is the brand new flagship phone from LG, released on the 26th June in the UK and 27th June in the EU (Rest of the world has varied release dates, Korea had the phone in May). It includes a 5.5 inch screen with what can only be described as the thinnest bezel on any android phone to date, which can make it quite vulnerable if dropped. There are plenty of cases already available for the G3, and whilst I am waiting for an official LG case to become available (review to follow in due course for that), I thought it was wise to review the Spigen Ultra Fit case as it was one of the more reasonable priced options on the market for those people who don’t want to spend much money on a case, but still want some form of protection. The case adds little weight or bulk to the G3, which is nice as the design is part of what makes the G3 such a nice device. It is easy for cases to add too much bulk to offer greater protection, but here this case is a happy middle ground. The case is made of a polycarbonate material that is coated with a non-slip soft feel surface, which is designed to enhance the grip on the G3. It feels good in the hand. The case is a solid build and cut to a good finish. The only “oddity” being the fact it has the words “Auto Focus” engraved under the volume buttons, which to me makes no sense at all – why do this? But don’t get me wrong, this doesn’t alter what the case is designed to do. The edges are smooth, which is nice, often you find that cases are poorly made and give sharp edges as a result, but not here. The G3 is quite unique in that all the buttons are on the rear, the bottom of the phone has a mic, USB port and headphone jack, with the top just having an IR emitter and a secondary mic (noise cancelling). The rear has the camera, volume and power buttons all in a line, with a flash, laser (for the camera, see the full G3 review which will be published soon) and a speaker. The case doesn’t cover the top or bottom of the phone so those ports are 100% accessible. The high quality build of the case means that the spaces for the camera/button line, flash, laser and speaker are all perfectly cut so that they are all accessible too. The G3 just snaps into the case and it provides an instant snug and protective feel. The G3 will not simply pop back out the case. Getting it out is much the same as getting the back cover off of the G3 (or for people who have owned Samsung devices, similar to those too). The case offers significant protection to the left and right and sides of the device, protecting the G3 where it has that famously thin bezel. It also offers protection to the back of the device for those of you who are constantly putting it onto say, a desk (not that the plastic back of the G3 will be easily damaged anyway). Where this case doesn’t offer protection is to the top and bottom edges of the G3, these will be left exposed if you were to drop the device. The case comes with a screen protector for those that want to protect the glass, not that, in my opinion, it is required on a device with Gorilla Glass.